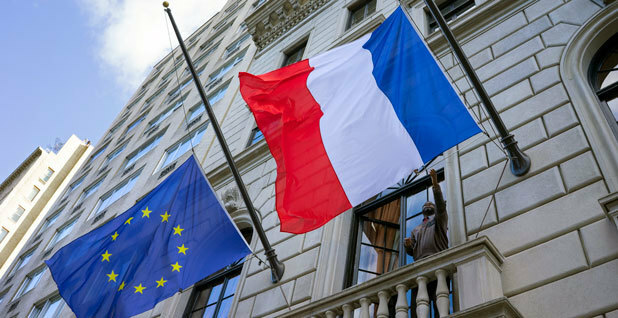 The flag of France, lowered in the wake of Friday's terrorist attacks in Paris, is adjusted at the French consulate in New York. Photo by Craig Ruttle, courtesy of AP Images. But just how robust the event will be is still unclear. Early today, French Prime Minister Manuel Valls told a radio station that only the negotiations themselves will take place and not the "concerts and festivities" planned around it. The U.N. talks were expected to draw some 40,000 people to Paris. The death toll from Friday's carnage -- when gunmen, some armed with AK-47s, opened fire on a Paris concert hall, stormed popular restaurants and set off explosions at a packed soccer stadium -- rose to 129 by last night. The Islamic State group has claimed responsibility. French President François Hollande declared the attacks "an act of war" and vowed revenge. Diplomats from New Zealand to the Maldives said they believe the vicious assaults on ordinary citizens are precisely the reason the 21st Conference of the Parties (COP 21) to the U.N. climate convention must still convene as planned. U.S. President Obama and Secretary of State John Kerry will be among nearly 120 heads of state attending. "COP 21 has to take place; otherwise, it would mean being weak and scared by terrorism, which would be for them an additional victory," Pascal Canfin, France's former minister of development, told ClimateWire. Agreed Jeffrey Waheed, deputy permanent representative of the Maldives to the United Nations, "We cannot acquiesce to brutality. It is important that terror attacks don't dissuade us from what's most important to the international community." The two weeks of talks begin Nov. 30 and will take place at Le Bourget airfield on the outskirts of Paris. They are expected to culminate in a new international agreement to lower greenhouse gas emissions and possibly put in place a system by which nearly 200 countries can regularly enact new and stronger climate targets. The conference is important to France both economically and politically. The government has already invested €170 million ($182 million) -- about 20 percent of it raised from private funds, according to the COP 21 website. Leaders hope the 20,000 people accredited for the conference and an additional 20,000 more expected for other events throughout Paris will bring in €100 million to the region in hotel and restaurant spending. Meanwhile, the agreement itself is viewed as a critical political win for Hollande as well as Obama. Both leaders have expended massive amounts of political capital on the Paris agreement, raising the issue at nearly every bilateral meeting. That's partially why, analysts said, less than a day after the attacks, French Foreign Minister Laurent Fabius reacted quickly when asked if the climate talks would be canceled. "No, no, no, no, no, the COP 21 [is] to be held. It will be held with enhanced security measures, but it is absolutely essential action against climate change, and of course it will be held," Fabius told reporters in remarks reported by Climate Home. 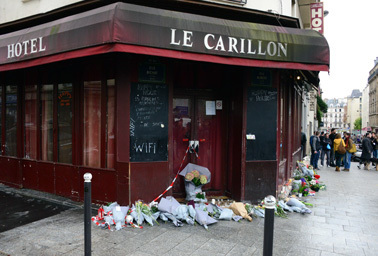 The restaurant Le Carillon one day after the terrorist attacks in Paris. Photo by Laurenet Benhamou, courtesy of Sipa via AP Images. While a handful of people, most notably former French President Nicolas Sarkozy, raised concerns about the decision, most people in the global climate community praised it. Sarkozy, who early yesterday said going forward with COP 21 "would mean taking unbelievable risks," did not ultimately call for a postponement, according to the French press. "I can fully understand the reasons behind the decision," said Jo Tyndall, New Zealand's climate change ambassador. "This [COP 21] has been hugely important to France. Postponing it would send, I imagine, the sort of signal they would not want to send to those responsible for these attacks." Ronny Jumeau, ambassador to the United Nations from the Seychelles, said he was hoping French leaders would press forward. He argued that bringing 40,000 people to fight in negotiating halls and on the streets for a safer atmosphere is exactly what the world should be seeing in Paris. "It also sends a message to the people behind the attacks. The world is not going to stop for you," he said. Yet while the negotiations themselves are expected to continue, it remains unclear whether the dozens of events happening on the sidelines of the summit will still occur. Iain Keith, a senior campaigner with Avaaz.org, which is helping to coordinate a massive march through Paris on Nov. 29, said his team will meet tomorrow. "In all honestly, it's pretty much the police's call now. The most important thing for us is safety," he said. "We will follow the police's lead." And Lisa Jacobson, president of the Business Council for Sustainable Energy, said industry leaders hope to still be on hand in Paris but are willing to dial back their participation if new security measures call for it. "Our delegation is prepared to go, provided that's what the French government and the U.N. and the State Department think is the right thing to do. We want to be constructive in a time of crisis," she said. In his remarks to RTL Radio, according to Reuters, Valls said "a series of demonstrations planned will not take place and it will be reduced to the negotiations ... a lot of concerts and festivities will be canceled." Residents described Paris yesterday as a city on edge and restless in its mourning. Outside the cafes that were the site of fear Friday night, flowers were piled high. Meanwhile, streets and restaurants that had been emptied out a day earlier once again sprang back to life as people decided they could no longer stay indoors out of fear. Keith, who has been working in Paris the past months to prepare for the march, said the sun was out yesterday afternoon and he was finally taking a walk. On Friday, he had been with a group of activists attending former U.S. Vice President Al Gore's 24-hour live climate webcast from the foot of the Eiffel Tower. Then he went to dinner near the Place de la République with friends. The main course had just arrived when shots rang out. People started to run, but Keith said he reacted slowly. "We were about to run and the barman grabbed us and said, 'Get inside,'" he said. They ran downstairs and hid in the bathroom with about 15 others for an hour. Keith said that of the 20 or so local and international climate activists working on activities related to the upcoming U.N. climate conference in Paris, none were killed or injured. "Amazingly, miraculously, they're all accounted for. But everyone is shocked and has been touched by this," he said. He and others said they hope the climate march will still go on and be even larger than expected in the face of the attacks. "I think the march will go on. And it is indeed possible that people will use the march to express their solidarity with the victims and their desire for a more peaceful world," said Wendel Trio, director of Climate Action Network Europe. Jumeau said he thinks signing a global climate change accord that keeps countries like his safe from the threat of rising seas and addresses the resource depletion that military leaders say help foster extremism would do the same. "It's been a very long and frustrating and painful journey at times, and finally we have an agreement in our sight," he said. "Let us leave with something positive this Christmas and New Year. Something positive for climate change and the world in the face of terrorism."